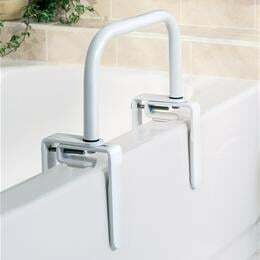 Bathtub Safety Rails: An Economical Choice For A Safe Grip Around The Tub. White Powder-Coated Steel With Foam-Lined Clamps That Won'T Mar Tub Surface. Mounting Bracket Adjusts 3.5" To 6" (9-16Cm) To Fit Most Standard Tubs.